Metal Insert For added Strength and Rigidity! KBDD tail Blades are made from a composition of different materials. Our airfoil is very unique. The air foil pulls the air back together to allow the following tail blade to cut through clean, less disturbed air. This allows our tail blades to be more effective. The airfoil also has a larger surface area which moves more air than longer tail blades. Our tail blades offer the performance of carbon fiber but are much more durable and cost far less. 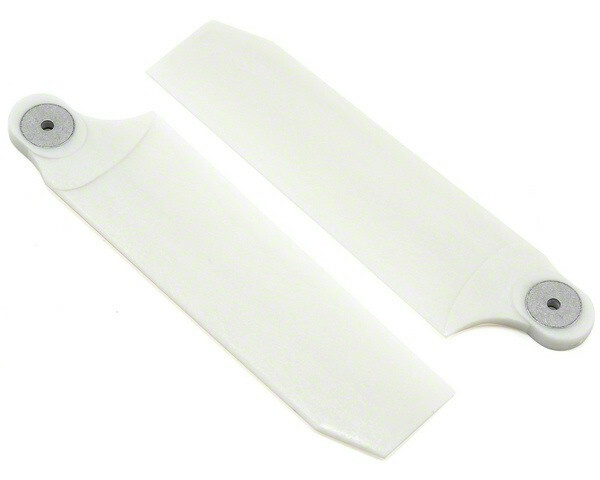 When cost performance and durability are considered, our tail blades are the best on the market. Tail blades of the same size can be mixed as they weigh EXACTLY the same. Try mixing colors to make your helicopter unique. Click the button below to add the KBDD 112mm Extreme Edition Tail Blades (w/ Metal Insert) (PEARL WHITE) 4084 - GOBLIN 700 / TREX 800 to your wish list.